This is one of the more challenging routes in our Ten Great Rides package. The climbs on Cavedale and Veeder are long and sometimes steep, and some of the descents are what riders like to call “hairball”: steep and twisty and technical. So this is not a ride for beginners. The ride stages out of the town of Sonoma, from a parking lot just behind the town Plaza and the historic adobe army barracks. Sonoma is one of the cornerstones of California history: the northernmost outpost of Spanish (and later, Mexican) empire and the home of General Mariano Vallejo, a fine man and able colonial administrator who had the misfortune of being on the wrong side when Yankee settlers staged what was to become known as the Bear Flag Revolt in 1846, raising their grizzly-emblazoned flag over the Sonoma Plaza and proclaiming California an independent republic. The republic only lasted a few weeks, until word arrived that the United States had declared war on Mexico, and the insurgents threw in with the US. Within a few years of course, gold had been discovered, California had become a state, and the rest, as they say, is history. Unless you’re completely indifferent to our local heritage, you’ll want to poke around the Plaza a bit. There are numerous, well-preserved buildings from that pivotal time and earlier, including Vallejo’s adobe compound and the mission, as well as his own home, right on our route within the first mile. There are also plenty of places to find food and water. While the center of town has charm to spare, the outlying fringes to the west and north of town are more eyesore than anything else, and unfortunately, our route has to navigate a few miles of this mess before reaching pleasant country again. The ride begins by riding from the parking lot north to a bike path that traverses the city along an old rail line. The route calls for us to turn right off the path onto 5th Street West. However, there isn’t any sign on the path to tell you which of the cross streets is 5th. If you can figure it out, turn right on 5th. If not, it really doesn’t matter. The bike path will lead to Hwy 12 in a few more blocks. Turn right there and you’ll soon be back on course. There is the two-mile section of trashy commercial crud along here we wish we could avoid. The area was built out during an unfortunate period: not long enough ago to have the charm of antiquity, but too long ago to have been subject to any enlightened zoning ordinances. It’s just a hodgepodge of stores and gas stations and down-at-the-heels neighborhoods. Oddly, the ultra chic, super luxurious Sonoma Mission Inn and Spa sits in regal splendor right in the middle of all this tacky sprawl. Anyway, it’s not great riding, but is tolerable, and not really dangerous, because the traffic is moving at slower, city-street speeds. When you finally leave the congestion behind, you have about a half-mile of open country on Hwy 12 before leaving the busy artery behind for a right turn onto blessedly quiet Cavedale Road. You have now arrived at a big climb. It’s more than just a big climb though: it’s a great road...one of the best of the region’s many dinky mountain roads. It is typically almost devoid of auto traffic, is often just one lane wide, and once you’ve hauled yourself up out of the canyon, the views are fabulous. Most of this big climb has terrible pavement, but as it’s taken at slow climbing speeds, it’s not really a problem. There is a curious little monument beside the road just at the base of the climb. It commemorates the construction of the road in 1915. The work was financed entirely by private subscription and the donors are all listed on a handsome plaque, with the amounts they chipped in, from $165 from E. E. Hicken down to $5 from W. E. Henderson. We’ve heard an anecdote about this that we repeat here with the caveat that we have no idea whether it’s true or not: according to the tale, there was a high-class brothel secluded up in this canyon, and the men who put up the money to build the road did so to facilitate access to this establishment. Whatever their motivation, we’re glad they did it, because they bequeathed to us a fine road through a piece of majestic backcountry. The grade is not constant at all on the climb. Sometimes it’s over 15% for short pitches, and sometimes it’s almost level, allowing you to catch your breath. Overall, you gain about 2000’ in five miles from Hwy 12 to the first summit. 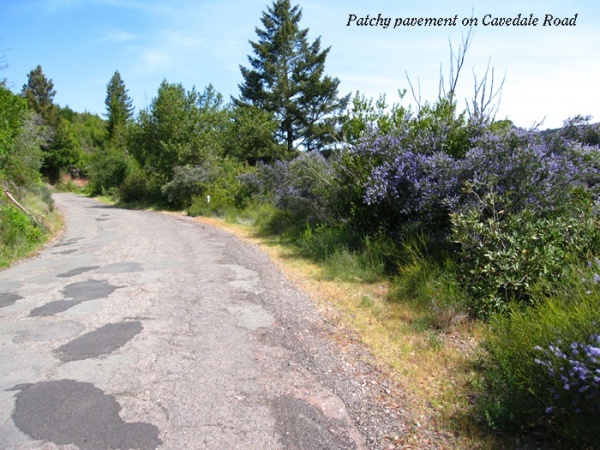 Most of the time, you’re riding through forest of oak, fir, and madrone or out across stony hillsides that have more of a look of dry chaparral, with manzanita and other low shrubs and wildflowers predominating. There is a cave on Cavedale as well. It’s small and doesn’t go much of anywhere, but it’s there, right alongside the road. During the Christmas season, small presents are sometimes seen at the mouth of the cave, left as offerings for the troll who lives within. Off the far side of the 2300’ summit you get to negotiate a series of steep, highly technical descents and small climbs in deep fir forest. The technical aspect comes from the fact that the pavement is quite patchy and unpredictable. It used to be terrible, but has recently been given a rather mediocre repaving which has improved it a little. It’s still a descent to handle with care. After a bit more than two miles of this bumpy up and down, you come to your next junction at Trinity Grade. There is a firehouse on the corner here where you can get water. It’s the only resupply point out here. 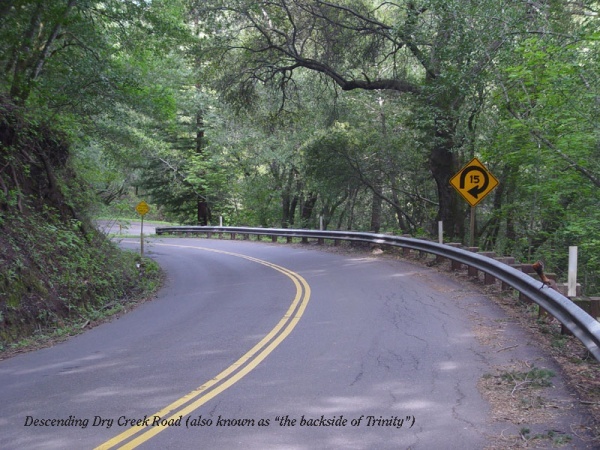 Trinity Grade turns into Dry Creek Road. It’s all one, continuous road, with no apparent changes. When you turn from Cavedale onto Trinity, you climb very gently and very briefly to a pretty, level run along the hillside, with some great views out through the trees to the valley below. Then the forest closes in, the road tilts downhill, and things get very exciting very quickly. The main chunk of this descent is only a bit over two miles, but it ranks as one of the best, most memorable downhills in the region. It’s also potentially one of the most perilous, if you don’t exercise good sense. The pavement is silk-smooth, so that’s not a problem. In fact, it encourages you to want to really let it fly. But the hill is just too steep and the corners are too tight to support that sort of full-tilt flier. This descent comes at about mile 30 in the Terrible Two double century. We always warn the riders ahead of time to take it easy on this, the first big downhill of the day. We always put a course marshal at the top of the hill to remind people to slow down. And yet, year after year, riders—crazed by adrenalin and testosterone—attack this thing as if the finish line were at the bottom of the hill and not 170 miles away. And year after year, they go flying off into the bushes or over the cliff...bikes bent, bodies broken. And these are supposedly skilled, experienced riders. We hope you will pay more attention to the warning than they do. If you can manage to control your wildest death-wish urges and soft-pedal the first steep, corkscrew section of this drop, you’ll end up having a really great ride down the mountain. When the fast, twisty part of the descent ends—at a small bridge over the creek—you get another couple of miles of mild downhill along the creek to decompress. Then it’s time to turn right onto Mt. Veeder Road. Drop a little, cross the creek, and get ready for another big climb. This downhill is every bit as much fun as the one on Dry Creek, and to make it even better, it’s much longer: almost eight miles! (In the relatively small hills of the North Bay, it’s rare to find a descent that long.) The last couple of miles are almost flat, but you can carry a lot of momentum through that section, so it still seems as if you’re zipping along effortlessly. It starts out steep enough to be really fast, and there are loads of tricky corners to test your handling skills and your courage. Pavement is generally quite smooth, but there are enough potholes and cracks to keep you from getting too cocky about just letting it rip. After three or four really exciting miles, the grade eases off a bit, and in some ways, this actually makes the descent more fun. You can stop worrying so much about killing yourself and start being aggressive in the corners. Whether you do the add-on or not, you will eventually continue downhill on Redwood. You still have some miles to go of enjoyable descending, although the grade at times begins to almost level out. Quite often in this section, the pools and cascades of Redwood Creek are attractively deployed alongside the winding road. This is really a great section of road...the kind of road that will have you grinning from ear to ear. Unfortunately, even long descents must come to an end, and in the case of Mt. Veeder/Redwood, it does so smack into the suburban fringe of the city of Napa. Welcome back to reality! Actually, this isn’t too awful as suburbs go. Turn right from Redwood onto Browns Valley and right again in about a mile on Buhman. All of this is suburbs. There is an elementary school on Buhman where you can get water, and this is the first resupply point since the fire station at the top of Trinity. If you want store-bought food, there is a market just a few blocks off-course on another section of Browns Valley (see map). As you leave the suburbs on Buhman Avenue, you climb over a brief hump of perhaps 100’ in half a mile. Once over the top, you’re in the country again. Zoom down the other side, but stay awake for a turn at the bottom of the hill. You’ll be staying on Buhman, but that requires a hard bend to the right at a junction with Congress Valley Road. One mile later, you turn right off Buhman for another brief climb on pretty Henry Road. Zig zag back and forth along a series of quiet little lanes through open, rolling hills, cut across busy Hwy 12/121, climb one more short hill on Duhig Road, and descend into another world. This is the beginning of a different wine region than Napa Valley. It has its own official appellation: the Carneros region. These rolling hills flow gently down to the northern reaches of San Francisco Bay, which you can see shimmering in the distance, off to the south. On a clear day, you may even be able to see the glittering towers of the big city, 25 miles away across the water. Supposedly, part of what makes this region so nice for grapes is the fog rolling in off the bay, so be prepared for it to be cool. The softly rounded hills are given over almost entirely to wine production, with only a few isolated stands of trees and the occasional small pond breaking up the endless rows of vines. Along the fringes of the bay, there are vast tracts of salt marsh and tidal wetlands, mostly fairly wild, but in some cases supporting dairy herds. There are also one or two marinas where the Napa River meets the bay, and a few clusters of vacation homes strung out along the levees, above the flood line. The main highway through the Carneros is Hwy 12/121, which is a nasty, busy road unsuitable for cycling. (We do ride on it very briefly to connect two back roads, but we would not recommend being on it for any more than the bare essential minimum.) Fortunately, there is a great alternative nearby: Ramal Road. After the brief climb on Duhig, you zip swiftly downhill to a junction with Ramal, which meanders all the way across the district as a sleepy road to nowhere. Ramal loops south and west along the bay and then curls north toward the old town of Sonoma. Midway along Ramal, you will pass back into Sonoma County. As you approach the town of Sonoma along a rather confusing tangle of little roads, the scenery slowly changes from agricultural to rural-residential to city streets. What with the big climbs you’ve done on Cavedale and Veeder, and possibly Redwood, we don’t really think this ride needs any more optional add-ons. However, if you think it does, we will offer one suggestion here. When you come up 7th Street East and hit the corner of Lovall Valley Road, the route turns left into the town of Sonoma. If you turn right on Lovall Valley, you can enjoy a nice little up-&-back into the hills above the town. The climb is not too steep and turns into a nifty descent on the way back, and the scenery is great...a dry, southwestern-looking landscape with a pretty creek piddling along beside the road in a rocky channel. As you’re climbing, keep an eye out for a left turn onto Lovall Valley Loop Road. Taking this little road will allow you to circle around the top of the valley and connect back to Lovall Valley, now heading downhill, back to town. Having a loop at the end makes it a little more fun than just coming to a dead-end and turning around. The round trip will add about ten miles to the stage. Adding both the Redwood out-&-back and the Lovall Valley divertimento will turn a hilly 46-mile ride into a very substantial 63-mile adventure. Back on the basic route. A short run along the last, flat mile of Lovall Valley Road brings the route to the corner of the big Sebastiani wine facility. Directly across from the end of Lovall Valley is the beginning of the bike path that leads through town, the same path we set out on. Pick up the path here and roll the last few blocks back to the center of town. Turn left past the bocce ball courts and finish up in the parking lot. Stash the bikes and then go find a spot for lunch on the Plaza.